The Music of the Brill Building"
Former member of The Nylons Micah Barnes joins his pals, 4-time Juno-winner Billy Newton Davis, Gavin Hope and Tyrone Gabriel in a star-studded concert celebrating the classic ‘60s hits of the Brill Building. Included are such hits as “Save the Last Dance for Me”, “On Broadway” and “Up on the Roof” from the Drifters, Carol King’s “Will You Still Love Me Tomorrow” and The Righteous Brothers “You’ve Lost That Loving Feeling” among many others. promo code "Muskoka Pride" for the group rate. 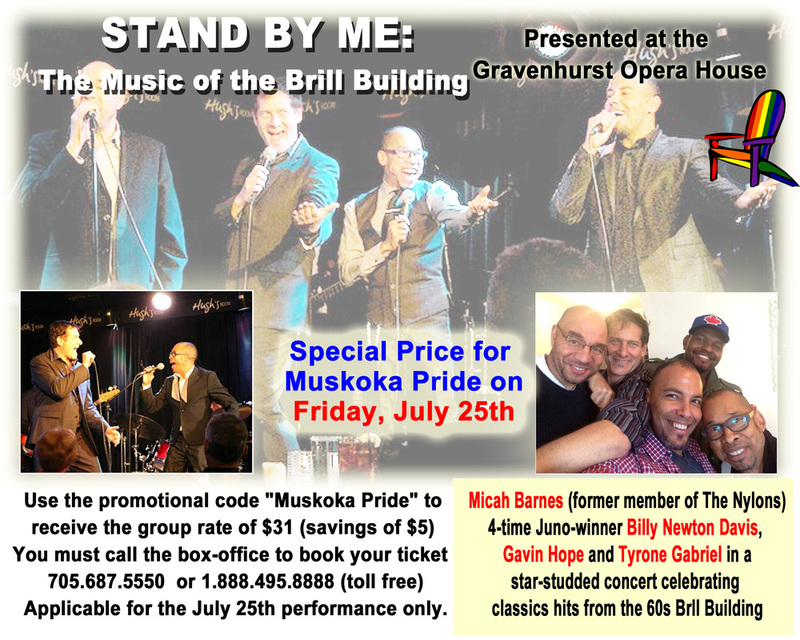 The "Muskoka Pride" promo code is only valid for the July 25th performance.